October 1939. "Lamoille, Iowa. 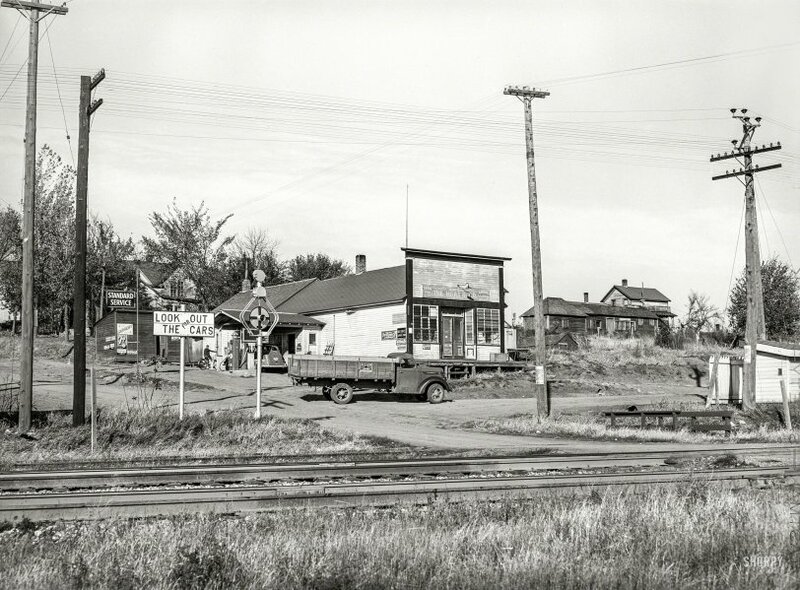 A village consisting of a few houses, general store, and railroad station." Medium format acetate negative by Arthur Rothstein for the Farm Security Administration. View full size. Submitted by Alex on Tue, 01/16/2018 - 12:08pm. Submitted by Lectrogeek68 on Sat, 01/13/2018 - 3:27pm. I've always thought that was one of the most aesthetically-pleasing truck designs ever. The most famous example, of course, was the Merry Pranksters' bus, Furthur. Submitted by Dale Neiburg on Sat, 01/13/2018 - 6:51am. says it also served as the post office. The barred windows might have been thought necessary for security there. Submitted by jsmakbkr on Sat, 01/13/2018 - 4:14am. LaMoille wasn't a big deal, but that particular railway was - and is - a huge deal. It's the main east-west corridor through Iowa, now known as the Union Pacific Corridor. Shorpy and FSA fans will recognize many scenes up and down the route, including the Clinton rail yards and the Kate Shelley High Bridge (fifty miles to the west). A 2002 Iowa Department of Transportation study found that 58 trains per day passed by this particular crossing at LaMoille, and that it was the county's most dangerous rural crossing. Submitted by tdubya on Sat, 01/13/2018 - 1:27am. The wig-wag signal was accompanied by a rectangular "Look Out For The Cars" sign in lieu of a crossbuck. The unused tracks may have went to a defunct grain elevator or some other business in town that needed a siding. Loomis, Nebraska, the town I grew up in, had a siding that went up to Commercial Street (Main street) and it went past a grain elevator and a lumber yard. In the late 60s, my family moved to a house across the street from the former lumber yard and the grain elevator was still there, unused. The track could still be seen going across Highway 23, but got buried when it got past the elevator. In 1975-76, the siding was taken out, the elevator burned down (as a Fire Department exercise), and the new scales for the elevator that was going up across the highway replaced the old elevator. Submitted by Spanky on Sat, 01/13/2018 - 9:08am. There appears to be a third set of tracks (long unused) on the far side of the two more obvious ones. To deserve two sidings, this little burg must have had a bit significance to the railroad at one time. Submitted by signalman on Fri, 01/12/2018 - 6:25pm. Those are two separate tracks. In a few places, you can see the ends of the ties under the far track. I suspect the near track is a siding, and not so well maintained (or used). Submitted by timotheus on Fri, 01/12/2018 - 5:53pm. Not much growth in Lamoille in 78 years. Now they have to travel to the next town to go to the store, and there is no rail station to get there. At least the county jail is only a couple of miles away. Submitted by rhhardin on Fri, 01/12/2018 - 5:45pm. Of the four rails, the two used ones seem to interleave with the unused ones. That would happen with a switch but they don't seem to be diverging fast enough; also the unused pair is in bad shape. Submitted by ComradeAnon on Fri, 01/12/2018 - 4:45pm. My Iowa born father used to recite "Railroad crossing, look out for the cars. Can you spell that without any Rs? T.H.A.T " It wasn't funny back then either. Submitted by Angus J on Fri, 01/12/2018 - 4:32pm. This type of railway crossing warning signal is known as a wig wag, and you can see how it looked and sounded in this video clip. In earlier days trains were sometimes referred to as "the cars". Submitted by Minnesotaart on Fri, 01/12/2018 - 3:57pm. Looks like they had to put bars on the windows for some reason. You'd hope there wouldn't be theft in small town Iowa back then. Submitted by pennsylvaniaproud on Fri, 01/12/2018 - 2:23pm. 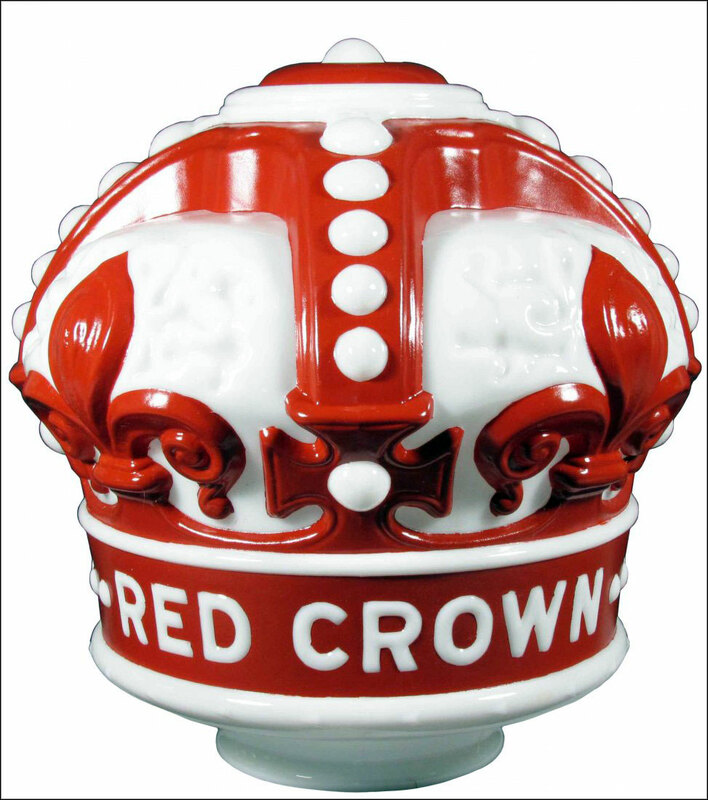 I sure hope someone or somebody had the sense to save that Red Crown gasoline globe. What a Gem.